Much is often made of the idea that Indian people developed so many specialized bags, pouches, and other leather containers to assist them in their nomadic wanderings from place to place. In reality, though, Indian bag-making was just as prominent in highly settled agricultural tribes like the Cherokees and Navajos as it was among the Plains tribes who followed the buffalo herds. A leather bag is better suited for carrying certain objects than a pot or basket is, and native North Americans tended to place great importance on how well-matched a carrying case was to its contents. Not only were native bags specially sized and shaped to hold an individual type of object, they were often decorated to indicate precisely what belonged inside of them. There were two very basic styles of American Indian bags: soft pouches, made of tanned animal hides (usually deerskin or elkskin), and parfleche, made of stiff rawhide. Some modern Indian artists blur the two traditions by creating tanned buckskin purses with rawhide siding on the inside to give it the boxy parfleche look. 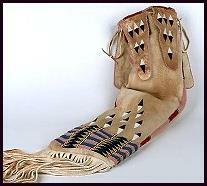 Regardless of their material, Native American bags were often painted, beaded, or quilled with the characteristic tribal designs of the craftsperson (usually a woman) who made it--particularly if the bag was designed to hold something sacred, such as a medicine bag or tobacco bag, or was being made as regalia for a fiance, daughter or son. In recent centuries the great specificity of Indian bag design began to change, with the development of the catch-all "possible bag" that could be used to transport any of one's possessions. Today, both specific and possible bags are still being made and decorated by artists from many different tribes, and they continue to be a lively and practical part of native life, much more so than baskets or pottery (which are generally treated only as artwork these days). Since non-native women also like to carry a purse or handbag, Indian bags are commonly made as trade items today as well. If you are looking to buy purses or pouches that were actually made by Native Americans--either because it's important to you to have the real thing or because you want to support native people with your purchase--then here is our directory of American Indian artists whose bags are available online. If you have a website of Indian bags to add to this list, let us know. We gladly advertise any individual native artist or native-owned art store here free of charge, provided that all bags were made and beaded by tribally recognized American Indian, Inuit, or First Nations artists. On our main site we do our best to avoid slowing down our page loading with graphics, but this page is about art, so we'd really be remiss in not showing a few representative bag pictures. All photos are the property of their respective artists; please visit their sites to see their work in more depth. These two Blackfeet ladies make classic Plains Indian beaded pouches, tobacco bags, possible bags, saddle bags, and knife sheaths. 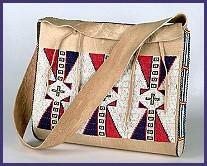 Beaded buckskin, elk hide, and parfleche bags by Shoshone and Arapaho artists. and knife sheaths in Plains Indian styles. Plains Indian parfleche in traditional envelope and cylindrical shapes, by a Cheyenne-Arapaho artist. Seminole Indian purses decorated with traditional patchwork designs. Colorful and inexpensive. 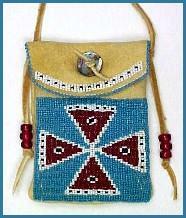 Beaded purses from a Mohawk Indian fashion designer. 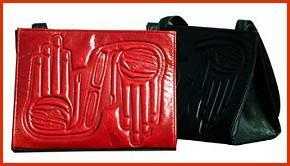 Designer purses embossed or embroidered with Northwest Coast Indian designs by a Haida artist. Bandolier bags are extremely intricate beaded shoulder bags of great ceremonial importance to the Cherokee and Woodland Indians. The most beautiful of tradtional Native American bags, they are still made and used for cultural and ceremonial occasions (the Ojibway men were wearing bandolier bags at the opening of the new museum in Washington DC), but not as tourist items. Some Indian artists do bead and sell them as museum-quality fine art, but you will not find an authentic bandolier bag being sold for less than $1000. 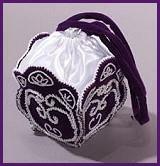 Traditional bandolier bags by a prominent Cherokee beadwork artist. 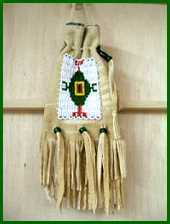 Traditional Plains Indian pipe bags made of beaded buckskin with fringework. 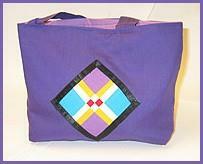 Another Plains Indian artist selling lovely pipe bags with traditional beadwork. Beaded amulet bags are actually jewelry, not true bags--they are necklaces with small beaded lockets for holding a personal charm. 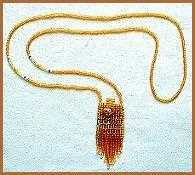 If you're looking for an amulet bag, have a look at our Beadwork Jewelry page. Most native artists who make beaded jewelry will make amulets like these, but artists who make beaded bags and pouches by stitching beads to leather generally do not. Art book primarily focused on Nez Perce and Paiute shoulder bags, parfleche and beadwork. 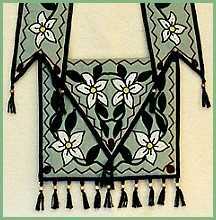 Small art book primarily focused on Ojibway and Potawatomi beaded bandolier bags. Outstanding exploration of Plains Indian beaded and quilled leather arts. Many photographs. A good book on American Indian art history in general from ancient times to today. a needle case, tobacco pouch and strike-a-light. Bandolier Bags: Excellent online exhibit of articles and pictures about the spiritual traditions and artistry of the bandolier bag. Bags and Pouches of the Canadian Natives: Anthropology text about First Nations bags. About us: This website belongs to Native Languages of the Americas, a non-profit organization dedicated to preserving and promoting endangered Native American languages. We do not make bags ourselves, so if you are interested in buying some, please contact the artists directly. Though we have featured only Indian bags and purses identified with the name and tribal affiliation of each artist, we haven't called the tribal offices to check up on any of them, and we only know a few of them personally. We also don't guarantee any of their products. This is not an exhaustive list of Native American bags--if you would like us to add your site to this page, please contact us with your URL and tribal affiliation. We advertise any individual native artist or native-owned art business here free of charge. We do not link to medicine bags which are not made by tribally recognized American Indian, Inuit, or First Nations artists, so please do not ask us to. And finally, websites do occasionally expire and change hands, so use your common sense and this general rule of thumb: if the creator of each individual artwork is not identified by name and specific tribe, you are probably not looking at a genuine Native American bag.